Each issue in this section, the editorial staff of Military Embedded Systems will highlight a different charity that benefits the military, veterans, and their families. We are honored to cover the technology that protects those who protect us every day. To back that up, our parent company – OpenSystems Media – will make a donation to every charity we showcase on this page. This issue we are highlighting Operation: Deploy Your Dress, a fully donation-based, volunteer-run, nonprofit organization that helps to offset the cost of attending military balls by collecting gently used and new formal attire to distribute free to military and dependent ID cardholders. Military balls are one of the unique experiences of military culture, fostering camaraderie and team building, says the organization’s website, and are a great opportunity for service members and their spouses or family to enjoy an evening of socializing and bonding. However, they can be expensive to attend. By offering a free dress to military ID card holders, Operation Deploy Your Dress strives to help more people attend these events and become closer to their communities. Operation: Deploy Your Dress was conceived in 2015 at U.S. Army base Fort Bliss (Texas), when founders Renee Chapman, Ronya Rendon, Yvonne Coombes, Liz McKenrick, and Melissa Riely decided to organize a dress swap among their units’ spouses as a way to defray the costs associated with purchasing formal wear for holiday balls. According to the organization, as of mid-2018 it has distributed more than 5,000 dresses free of charge to service members and their families. It depends solely on donations and volunteer labor and, say its spokespeople, tightens the bonds within the community, builds relationships between the civilian and military population, and improves the military experience for many military families. Operation: Deploy Your Dress now operates at Fort Bliss; Fort Eustis, Virginia; Joint Base Lewis McChord, Washington; Fort Irwin, California, Fort Benning, Georgia; and has done a pop-up distribution in Washington, DC. 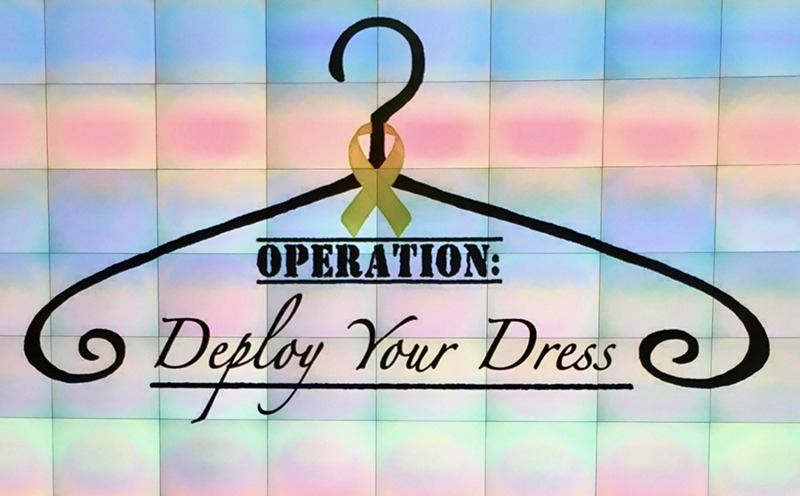 For more information on Operation: Deploy Your Dress, please visit www.operationdeployyourdress.org.